Joe Franklin – broadcasting legend and creator of the television talk show format – passed away last night (Saturday, January 24, 2015) at the age of 88. Joe, born Joseph Fortgang on March 9, 1926, was a pioneer in radio and television broadcasting starting his career on radio in 1940 with The Kate Smith Hour and then Make Believe Ballroom 2 years later. He began his legendary television talk show in 1950 on WJZ (WABC) in New York City and then moved to his longest home at WOR-TV, channel 9 in 1962 where his show aired until 1993. Late nights (and afternoon replays) were filled with Joe’s standard-setting interviews with guests ranging from local entertainers to the biggest of the big, including Charlie Chaplin, Rudy Vallee, Captain Lou Albano, and The Ramones. The shows were highlighted by Joe’s groundbreaking live commercial spots and his discussions of movie, music and entertainment history. Joe was widely recognized as an authority on nostalgia and culture of the first half of the 20th century and would always take time for a “Walk Down Memory Lane”, often including his guests in the discussion. The Joe Franklin Show aired on channel 9 from 1962 to 1993 and over his career, he reportedly interviewed over 300,000 guests. 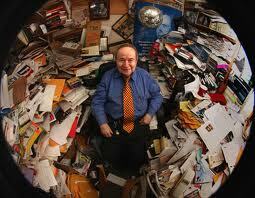 He is in the Guinness Book of World Records for being the longest continuous TV talk show host ever. He continued his radio show after leaving television and was still producing radio nostalgia bits up until his death. Joe holds a special place in our hearts here in THE DARK VAULT OF PUBLIC DOMAIN. We spent countless hours watching his one of a kind style in the wee hours of the morning back when we still got channel 9 in this area. His list of guests was staggering and whether his guests were banal, stellar, or bizarre, he always made the interview highly entertaining. Joe Franklin was one of the major influences that inspired me to a life in radio and the creation of The Uncle Pete Show and ultimately to our creating The Dark Vault Of Public Domain. Regular viewers may have heard our occasional “tip of the hat” to Joe and noticed, in our background and show ending, a picture of Joe sitting in his famously cluttered office. There was an even larger collection of interesting stuff in Joe’s office than in The Dark Vault! We’ll miss ya Joe! You were a great part of our lives and there’ll always be a place on our Memory Lane just for you! ~ by UNCLE PETE on January 25, 2015.